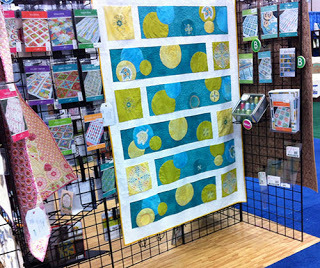 This Market I had lots of product to display in a tiny space so I decided to use color to unify the look of the booth… aqua and green were the order of the day. 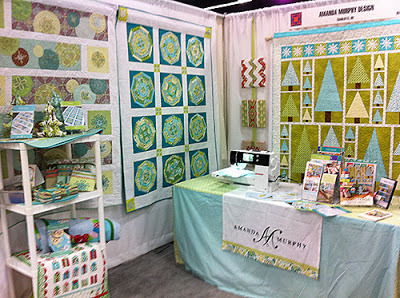 I debuted my book Modern Holiday… you can see the cover quilt on the back wall and some of the smaller projects on the shelves. 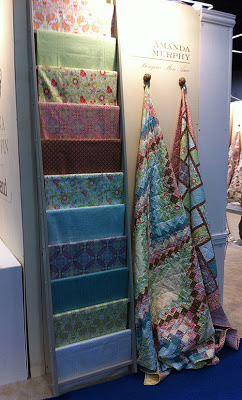 I also debuted two fabric lines with Blend Fabrics – “Bonjour, Mon Ami” and “Holiday Bouquet”. And five new patterns including three quilts, one zippered bag, and one set of a table runner with placemats! 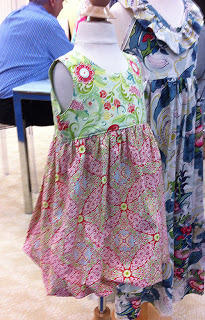 Four of my five new patterns were sewn in “Bonjour, Mon Ami” and Kona cotton. 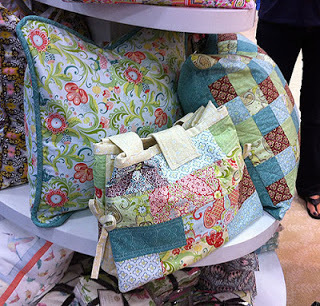 The fifth was sewn in Bella with a few Vanessa Christenson and Kona cottons thrown in. 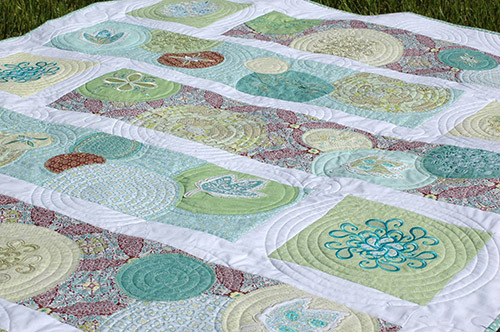 I’ll be working on sewing some of my Modern Holiday projects in Holiday Bouquet this summer and will show some of that here – can’t wait! 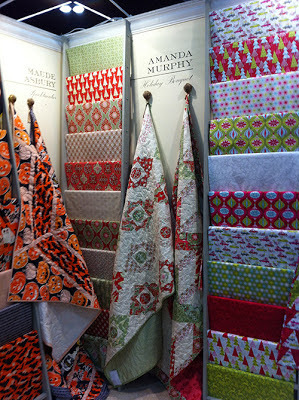 My fabric lines were also displayed across the way in the Blend Fabrics/Anna Griffin booth. Thanks to all the people at Blend for doing such a fantastic display. and “Hip Holiday” by Josephine Kimberling. on the bottom and is really cute, so check it out. Blend Fabrics even made accessories in “Bonjour, Mon Ami” to match! Because I was also debuting an embroidery collection with Brewer Sewing called Modern Blossoms, all of my project incorporate spaces for just a bit of optional embroidery – nothing heavy. Of course, you can also use feature prints if you don’t have an embroidery machine. “Soda Pop” in “Bonjour, Mon Ami” featuring my Modern Blossoms embroidery collection. 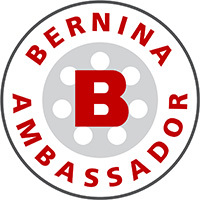 Oh – and I can’t forget my booth-mate! Cherry Guidry of Cherry Blossoms had the booth next to me. We also roomed together. We met through a friend who knew both of our work and thought we’d get along great. Cherry and I have the same birthday, we order the same food at every meal, and we both think it might be a good idea to start a 5-year Dear Jane quilt together, so I guess we both might be a little crazy, but we are big fans of each other’s work. Look at her cute forks and spoons and her adorable bike quilt! 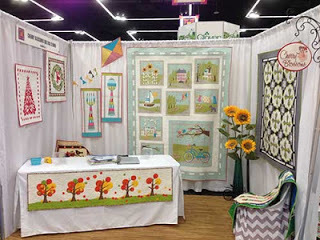 Soda Pop is a Brewer exclusive quilt that was also displayed in the Brewer Booth specifically designed to showcase the Modern Blossoms embroidery collection. They showed it in solids and I sewed it in prints – and it was great to have both so that people could see the different possibilities. 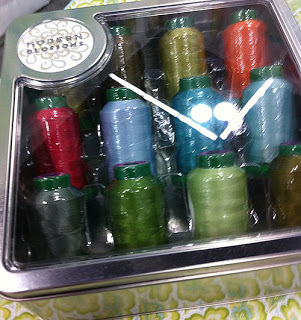 Brewer even made up a special tin to house the threads used in the embroidery collection! I’ll be back later in the week to show more detailed pictures of projects and patterns, but I couldn’t wait to share. Your booth and your quilts are absolutely beautiful. Loved to see it all! 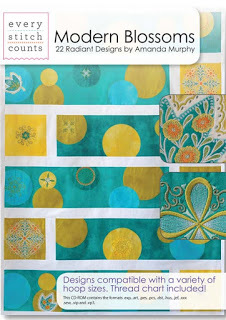 Congrats on your new book!…love everything I see here! Everything looks wonderful…congrats on a great Market time! 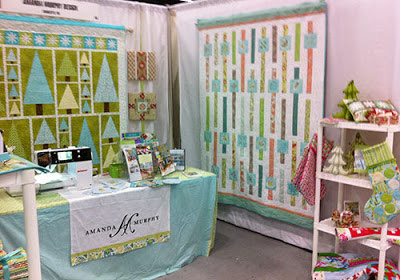 Your quilts are stunning and Your booth looks great, Amanda!! I love colors you used to create all of them!!! 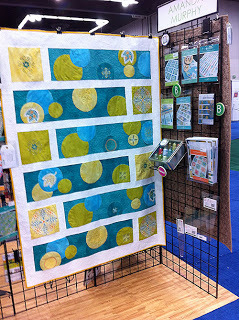 So many pretties….what is the quilt on the left hand, back corner of your booth….It looks like green circles (?) inside darker green squares with white sashing. It is only featured in your first photo in this post. Tell me more…I love it! Oh Amanda, Your both is just beautiful. Love your color choices. Your booth is beautiful!! 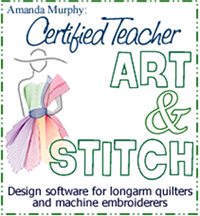 I want the fabric, the embroidery designs (I have the 780), the thread, and the pattern.